!! OMG, how cute: Mommy panda eats bamboo !! 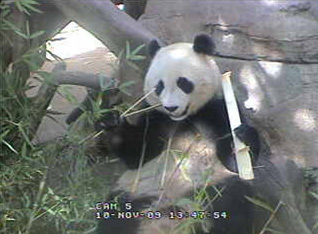 As you know, I am obsessed with the Panda Cam at the San Diego Zoo that follows the lives of a mom and baby panda in captivity (remember the cuddle and the baby check-up?). 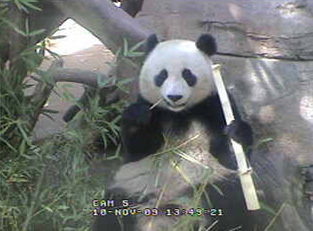 Today the baby was off somewhere and the mom was stuffing her face with bamboo. Adorable! See two more shots after the jump. 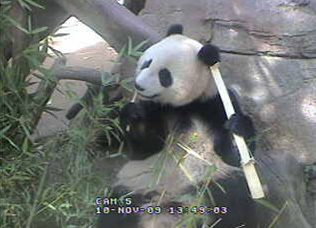 If you want Panda Cam for your Windows Sidebar, get it here. 1 Comment on "OMG, how cute: Mommy panda eats bamboo"
You and me Frank. Every time I go to the zoo, I make a beeline to the Panda’s. They are just way to adorable.